Colours White should be predominant, with black, brown, or tan markings. The Jack Russell Terrier can vary greatly in looks and coat type as the breed does not have a Kennel Club breed standard. Jack Russells are lively, busy little dogs and need to be kept occupied, both physically and mentally. Training needs to start early, otherwise the young Jack will get ideas above his station. Atopy is an allergic skin disease in which the dog's immune system overreacts to foreign substances, causing sore, itchy skin. Luxating patella is caused by abnormal growth of, or natural trauma to, the patella. The groove (which allows the kneecap to slide up and down when the knee bends back and forth) is too shallow. This causes the patella to slide out of the groove sideways, causing the leg to lock with the foot held off the ground. Perthes disease causes deformity of the ball of the hip joint. The blood supply to the head of the femur bone is attacked and the bone dies, resulting in arthritis or inflammation of the hip joints. Glaucoma is caused when the eye's natural drainage system becomes clogged, and the eye keeps producing fluid which can't be drained. This causes pressure to build within the eye. It is a painful condition and can result in blindness. There are no compulsory health tests for the Jack Russell Terrier. However, when looking at puppies, ask yourself: do they look healthy? Are they alert and inquisitive? Are their eyes and ears clean? Also, ask to see the mother. If in doubt, do not buy. Jack Russells are lively, busy little dogs and need to be kept occupied, both physically and mentally. They make ideal pets for active families. They should get on well with other dogs and pets as long as they are well socialised. Be careful around small furries. These game little terriers make excellent companions for children as they do, to some degree, enjoy rough play. However, as terriers they are predisposed to nip. As with all dogs, child/Jack interactions should be closely supervised. 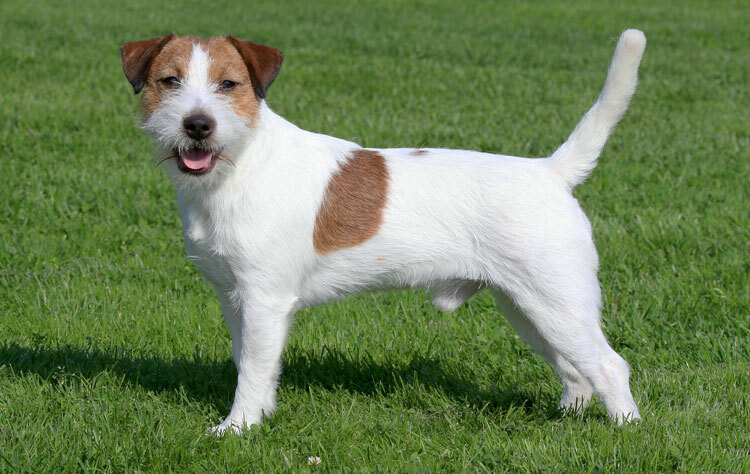 Jack Russell Terriers have bundles of energy and so excel at doggy activities such as agility. The Jack Russell is intelligent and quick to learn. Training needs to start early, otherwise the young Jack will get ideas above his station. It is imperative that he is taught, understands, and obeys the recall command from an early age. Good quality socialisation from a young age is very important. A Jack needs to meet other dogs, animals, people, and experience as many different situations and sensations as possible. Your dog's grooming needs will depend on his coat type. Some Jacks sport harsh full coats while others have a shorter, closer coat. Rough coats will require a daily once-over to ensure there are no knots or tangles, while shorter coats need little more than a weekly brush. Can be unreliable around small furries.